Today was Day #3 of Chocolate and Hemp Theme Week. There are several different chocolate breakfast cereals available in the U.S. However, very few of them are made of leafy greens -- in this case, kale. 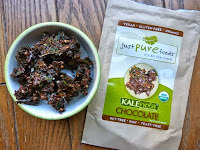 I enjoyed my bowl of vegan and gluten-free "Just Pure Foods" Chocolate Kalenola with cashew milk. This nutritious "green granola" was full of crunchy texture, from hemp, sunflower and pumpkin seeds, as well as sprouted buckwheat and shredded coconut. Suitable for either a cereal or a snack, the Kalenola was lightly sweetened with coconut palm sugar. Not too sweet, it was just about right for my taste.